Ali gets up before me. I started writing this saying that she generally gets up before me, and then I realized that I can’t remember a single instance of voluntarily getting up first. Ali gets up before me. I groan, flip over, and head back to sleep for either thirty minutes (during the week) or an hour (the weekend!). The result is that we almost never eat breakfast together, and I often skip it entirely. Occasionally, however, I make it into the kitchen in time to make a real brunch. The result always reminds me that I love breakfast food, and it should grace our table more often than, well, the occasional dinner. Brunch is amazing. 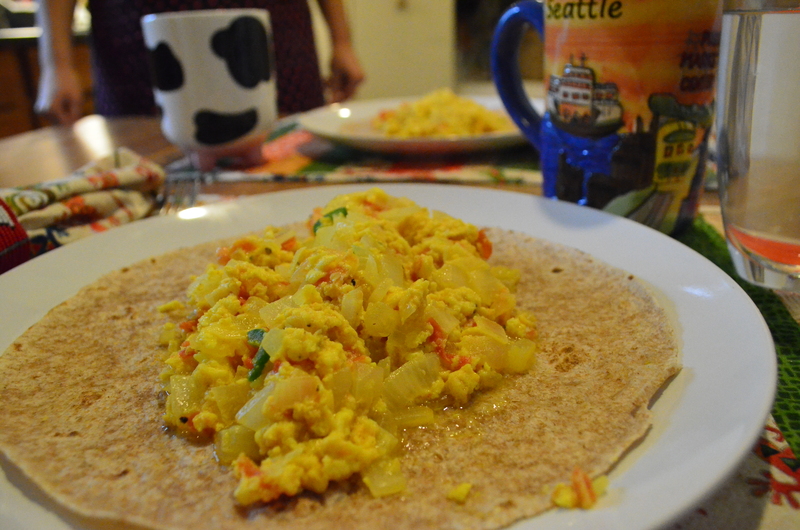 This post starts what I hope will be a trend– I want to blog enough that I am proactive and get up to cook brunch. I’ve already got french toast planned for tomorrow morning (stay tuned), so I know it has worked at least twice. One more data point and I’m declaring success. As I mentioned last week, I have been experimenting with Indian cooking recently, courtesy of the wonderful Entice with Spice. This recipe continues that trend, and indeed uses the standard core ingredients. One onion. One tomato. A handful of spices. Twenty-five minutes from start to finish, and serves three comfortably. Heat a thin film of oil in a medium skillet over medium heat, and add the onion. 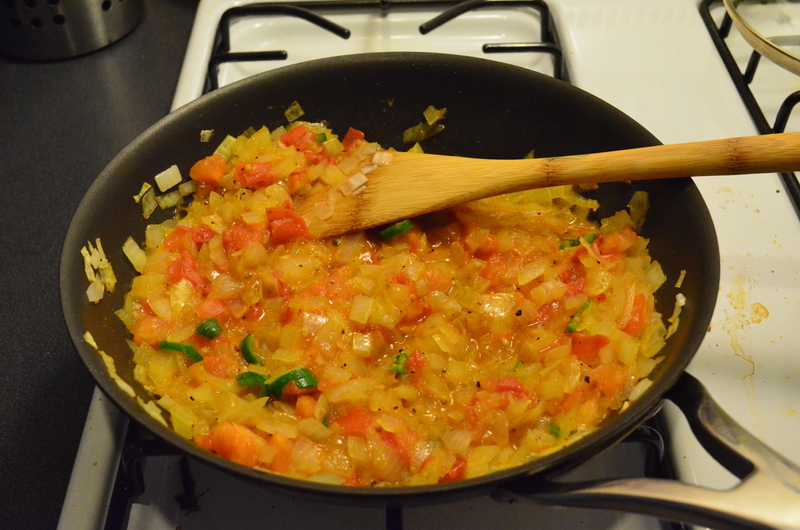 Sauté for a few minutes, until soft but not browned, and then add the tomato. 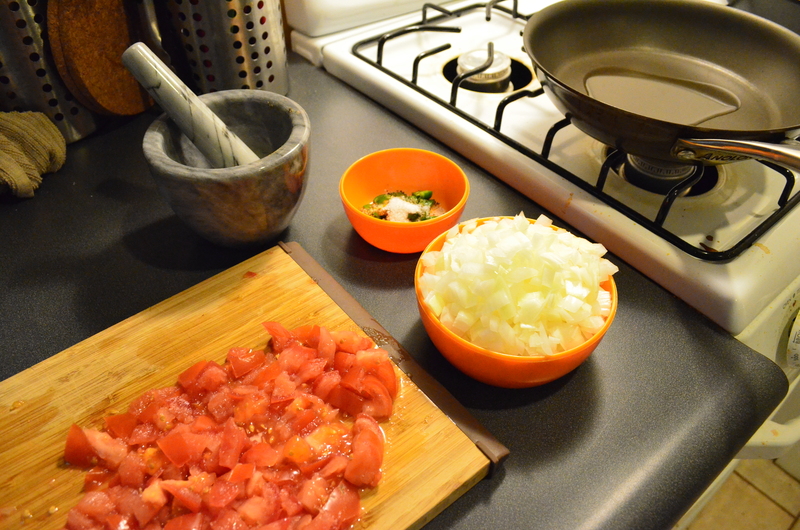 Continue cooking until the tomato has softened, then add the serrano and spices. Finally, pour in the eggs and cook, stirring frequently, until they have reached your desired consistency. 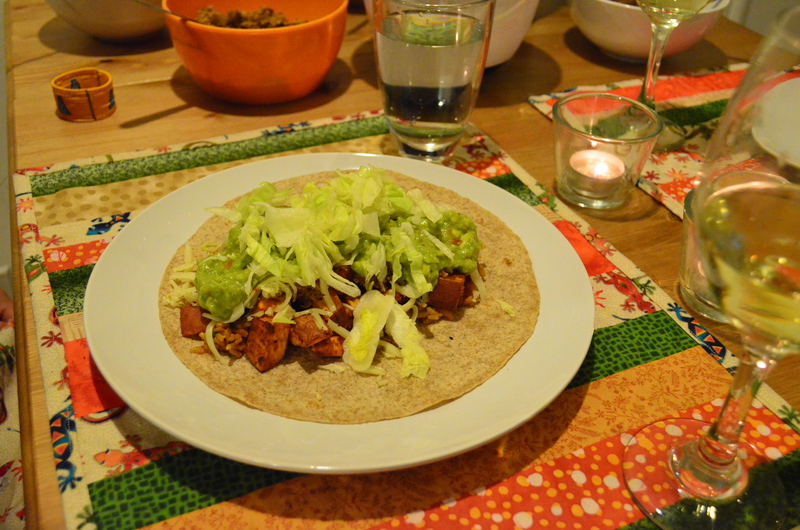 Serve wrapped in a warm tortilla, we use whole wheat. Before adding the eggs, tumeric leads to a beautiful pan. A little goes a long way. For those of you who prefer fried eggs or runny yolks, the original recipe calls for cracking the eggs directly into the pan, breaking them up, and just cooking until set. I prefer scrambled eggs to most other varieties, so I have adjusted the prep, but it is up to you. Eggs are truly wonderful, even if they are generally used for dinner in my apartment. But what is happening as you watch your eggs go from a liquidy, goopy mess to a delicious, goopy scramble? On a molecular level, 99.99% of an egg is water, surrounding a relatively tiny number of protein molecules. Proteins are enormous biological molecules, consisting of countless small building blocks (amino acids) linked together to form a long chain. In solution, however, these chains wrap themselves into a compact coiled configuration. This is due to bonds that form between different points on the protein, tying them into a neat package and minimizing effective size. Think of coiling up an extension cord for convenience sake. Additionally, negative charges on the outside of the coils cause repulsion between separate protein chains, forcing them to spread out in solution. When you heat an egg, two changes occur. First, the coil-forming intramolecular bonds break. This allows the proteins to unwind from a coil and transition towards a linear structure, and is called protein denaturation. Once spread out, the proteins tangle together. New bonds form between previously separate protein chains, and the resulting web solidifies due to increased bonding. Now our extension cords are mixed together, and we all know how hard they can be to separate. Water molecules find themselves incapsulated into small pockets, isolated and unable to flow together. With enough heat, however, even these water molecules are expelled and boiled away, resulting in the rubbery texture of overcooked eggs. Without water, the protein forms too many bonds and never wants to let go. Since moving to the Bay Area, I have been assailed by a wealth of restaurants from around the globe. The sheer diversity has broadened my horizons, and I have developed a particular love for Indian cuisine. Until recently, the curries, naan, and various appetizers seemed magical, with flavors that could only be the result of long hours on the stovetop (or traditional tandoori ovens). The cuisine hardly seemed designed for easy home cooking. When I stumbled onto a bit more free time and started working from home, however, it struck me as the perfect time to experiment. 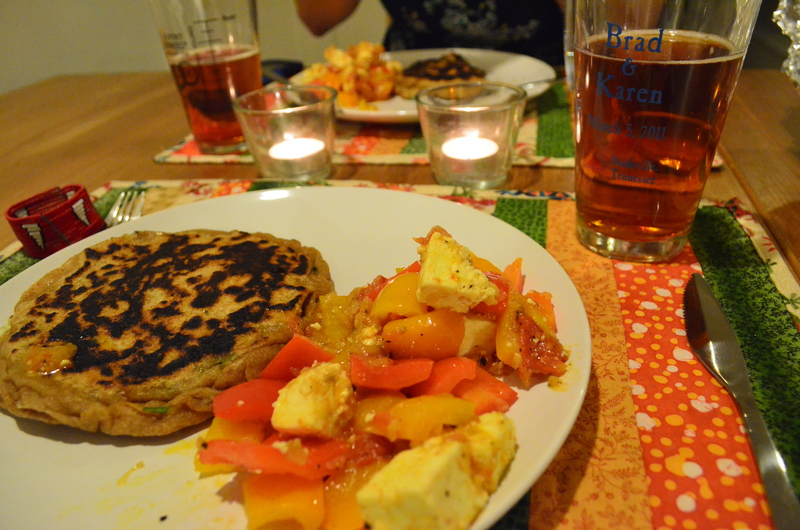 With help from a timely birthday, I outfitted my kitchen for Indian cooking and went to work. 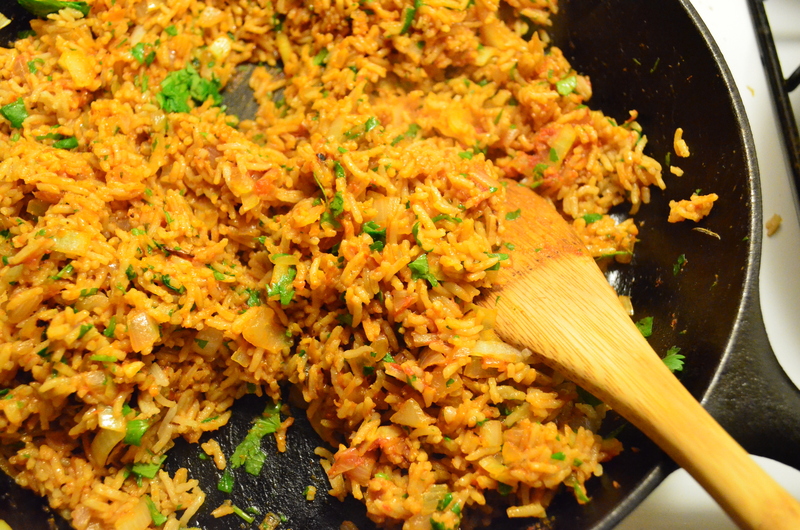 There are two main barriers for entry into home Indian cooking. First, the ingredients. Indian recipes have famously long ingredient lists, but luckily consist mostly of various spices. Beyond that point, almost all recipes can boil down to an onion, a tomato, and a couple unique components. Much more manageable. More importantly, however, Indian recipes often take a very long time. Most of us don’t have the ability to stay home every afternoon to slow simmer a curry and prepare a bread dough. My solution to this problem consists of one cookbook, Entice with Spice by Shubhra Ramineni. Subtitled “Easy Indian Recipes for Busy People”, many of the recipes in the book have been condensed to take less than 60 minutes from start to finish. I can’t speak highly enough of Ramineni’s dishes, which achieve the magical flavor of restaurant curry from the comfort of your home kitchen. According to Ramineni, a traditional Indian dinner consists of (at minimum) an appetizer, a salad, yogurt sauce, a bread, rice, a lentil dish, a vegetable dish, a meat or cheese dish, and a dessert. Even on my most elaborate nights I don’t match this feast, and I usually don’t come close. In this post, for example, Ali and I merely prepared two of Ramineni’s appetizers. Paneer with Bell Peppers, meant to be skewered and served as a visually appealing hors d’oeuvre, works just as well tossed together as a side dish. Potato Stuffed Breads, Aloo ka Paratha, stands alone as a breakfast or lunch dish, or serves as excellent accompaniment for a larger ensemble. Together as a dinner the two are hardly traditional, but, well, they still tasted good. I really love cheese. If I did an ingredient-themed food blog, it would almost certainly be centered around different cheese dishes. In Indian restaurants, however, I never gravitate towards paneer. Instead, I focus on the complex chicken and lamb curries. Chicken Tikka Masala has always been, and will always be, my favorite. But making paneer from scratch was irresistible. Here was a chance to really experiment, revisiting lab science from the comfort of home. A soft cheese, synthesis of paneer is remarkably easy. Add the milk to a large stockpot, and place over high heat. Bring the milk to a full boil, being careful to avoid letting it foam up and out of the pot, and then quickly reduce the heat to medium low. 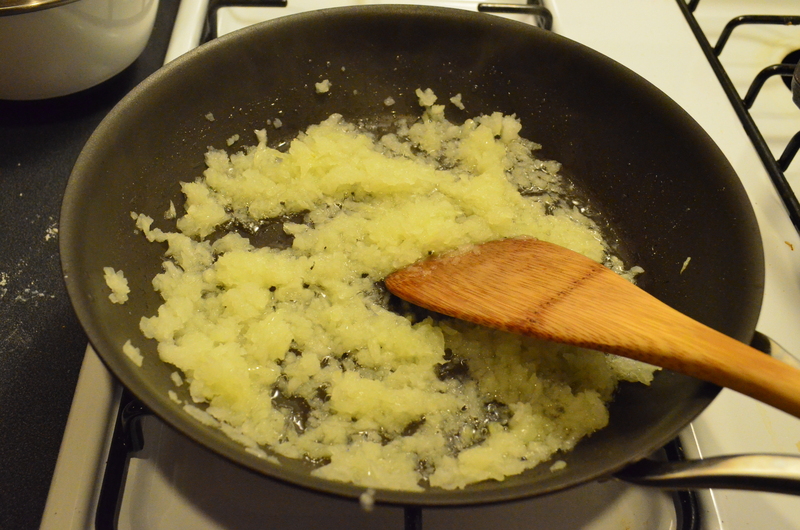 Stirring constantly, add the lime juice. The milk should gradually separate into solid (curds) and liquid (whey) components. If this does not occur within a minute, add another tablespoon of lime juice to the mix. 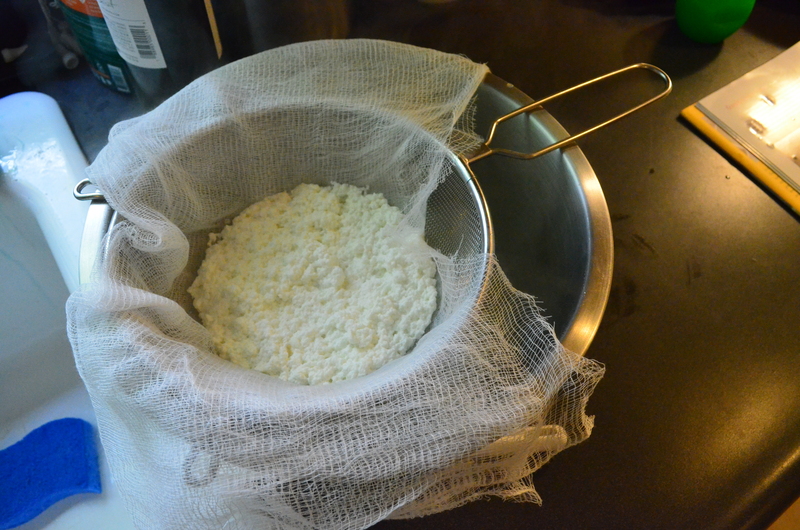 Line a colander with cheesecloth, and filter the mixture to separate the curds from the unwanted whey. I find that a cheesecloth should be folded 3-4 times to form a sufficient barrier. Liquid whey may be tinted green from lime juice. 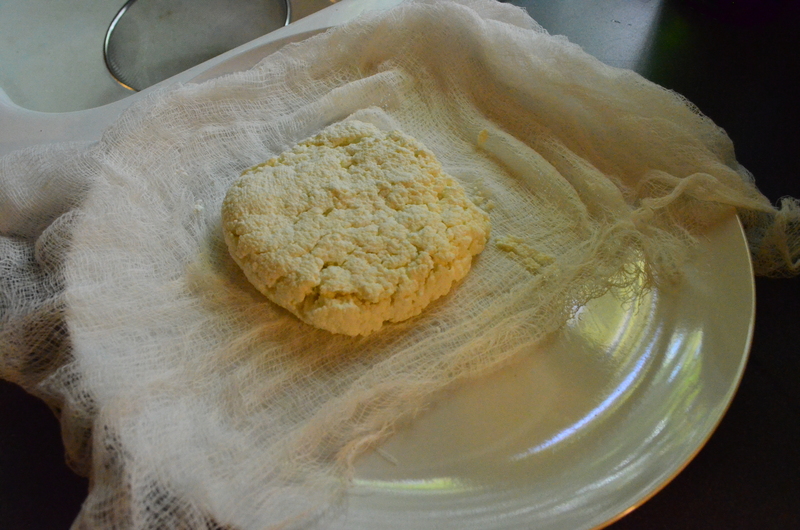 Fresh paneer sitting in cheesecloth as it drains. Let the curds cool and drain for a couple minutes, then bundle the cloth into a pouch and press it against the side of the colander using a large spoon. This should press out most of the excess whey, which can then be discarded. Shape the bundle into a rough rectangle, about an inch thick, and press underneath a weighted plate for at least 30 minutes to fully dry the paneer. Finally, unwrap the block and place it, covered, on a plate in your refrigerator. Chilling for at least an hour will improve the texture and solidity of the paneer. Try to use the finished cheese within a day. Shaped block prior to pressing. What’s going on with cheese curds? The chemistry involved in cheese making is pretty crazy. The specific time of year and diet of dairy cows can change the taste of milk or cheese, and the details are beyond me. Fundamentally, however, there are two classes of protein within milk. Whey proteins exist as individual molecules spread throughout the liquid, while casein proteins are grouped together in globular clusters known as micelles. 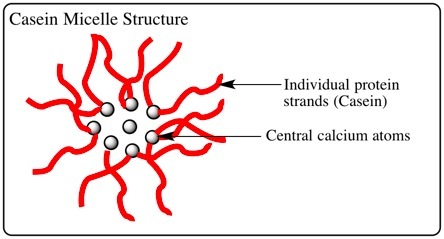 The individual casein strands are held together at one end (the head) by a glue of calcium atoms, and their tails repel one another to prevent aggregation of multiple micelles. When milk curdles this repulsion is eliminated, causing casein proteins to coagulate into a larger mass and form solid curds. The whey proteins remain separate in solution. Most cheeses come from the solid casein curds, but some (like ricotta) are traditionally made from concentration of the liquid whey. So why do some cheeses, like mozzarella, melt readily atop your pizza while others, like paneer, keep their shape and even harden slightly when heated? Both cheeses are made from casein proteins, and it stands to reason that they would have similar properties. The secret lies in two distinct methods of curdling the milk. When natural enzymes (generally chymosin) are used to curdle milk, the micelles remain intact, and the only change to their structure is to eliminate the repulsive charge that keeps micelles apart in solution. The micelles drift together, forming long chains and solidifying based on relatively weak interactions. When heated, these interactions breaks apart and the cheese melts. Acid curdling, however, generates a very different structure. Acid not only removes the repulsive charges, it also dissolves the calcium atoms which hold the micelle together. Casein strands spread out, and then come together again into a complex network of interlocking strands. This is a much more robust interaction, and the only change upon heating is to shake loose any water molecules within the paneer. 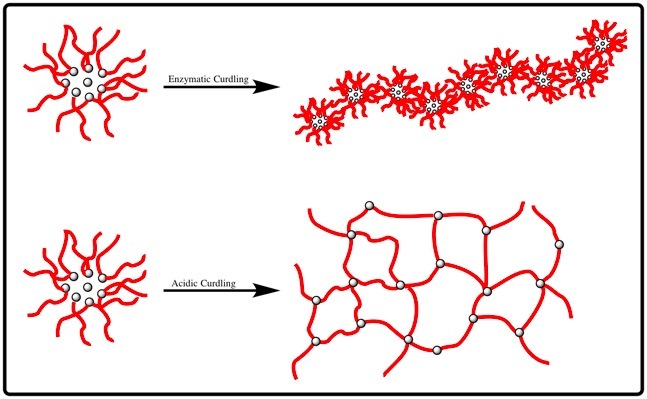 Casein micelles, illustrated here with red protein strands and black calcium “glue”, form very different curd structures depending on the method used to curdle milk. Grating an onion. Wow. This prep can be unpleasant, especially with an overly aromatic onion, but will greatly accelerate your cook time and is definitely worth it. 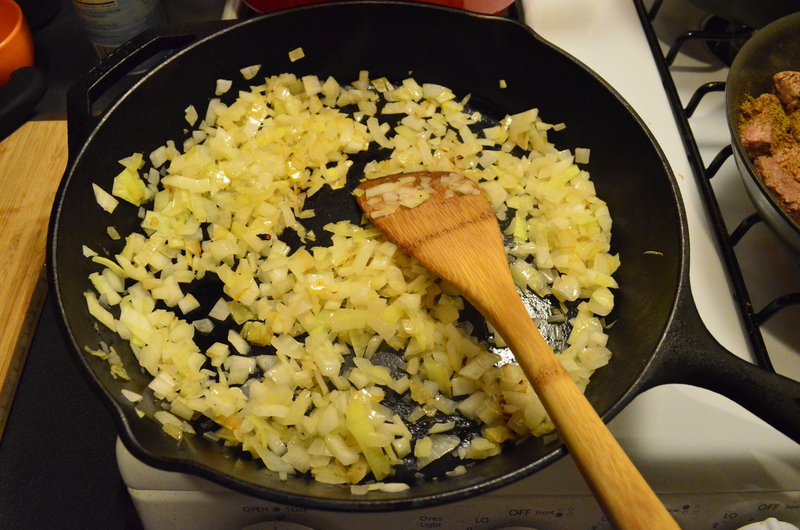 Heat the oil in a skillet over medium heat, and then add the onion. Cook, stirring frequently, until the onion is fully translucent and barely starting to brown. 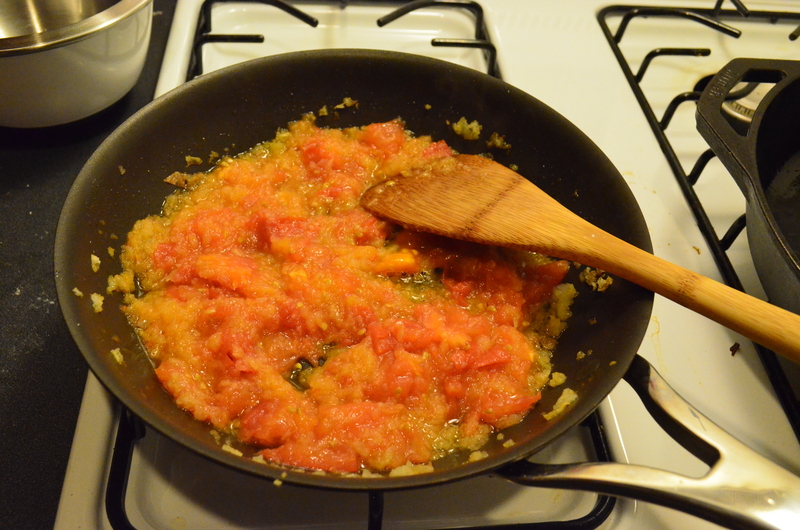 Add the tomato to the pan over medium-low heat, and cover the mixture. Every couple minutes, uncover the skillet and mash the tomato gently, until it resembles a rough paste. This should take around five minutes, and the skins can be pulled out as the tomato dissolves if you wish. Toss in the cayenne plus half the salt and pepper, and cook for an additional 2 minutes to finish the masala spice base. Once the masala is finished cut the prepared paneer into pieces (I do 16) and add them to the pan. Stir to combine, taking care not to break up the cheese blocks, and then sauté the mixture for a couple minutes, stirring infrequently. 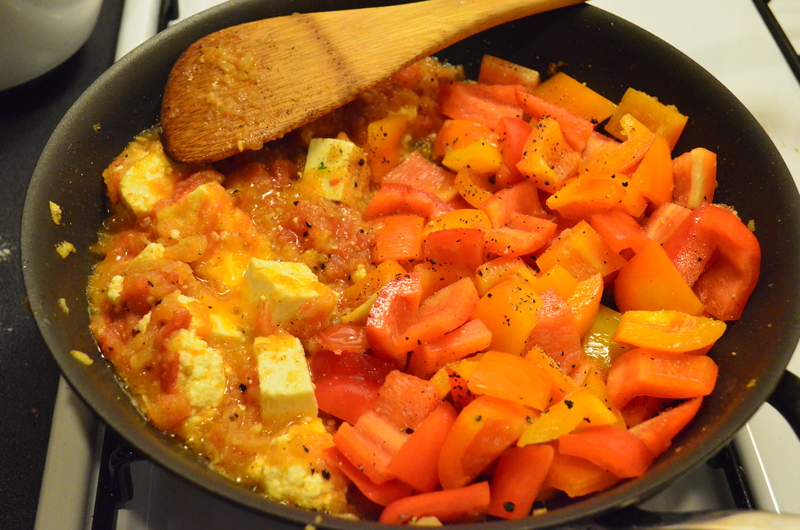 Push the cheese mixture to one side of the pan, add the bell peppers, and sprinkle with the remaining salt and pepper. Cook everything for five minutes, continuing to turn the cheese squares occasionally to avoid blackening. The peppers should soften and maybe char slightly while maintaining a nice crunch. When the peppers are cooked, turn off the heat and cover the pan for five minutes. Mix everything together and serve as a side, or thread pieces of cheese and pepper onto skewers for a visually appealing appetizer. Ali and I are on a constant quest to find potato variants that I enjoy. I generally hate the texture, and Ali pulls most of the weight in consuming our weekly allotment of CSA potatoes. I do, however, love bread, and so stumbling across a recipe for Potato Stuffed Breads provided incentive to brave the world of tubers. For this dish, you assemble a basic dough, and then place a mound of potato filling between two rounds and toss it into a skillet. The result is, ideally, a light and fluffy bread layer, just a bit charred, wrapped around a spicy mashed potato filling. Ours didn’t turn out perfectly, but they were still delicious. To make the dough merely combine the flours and water, and then knead for five minutes. 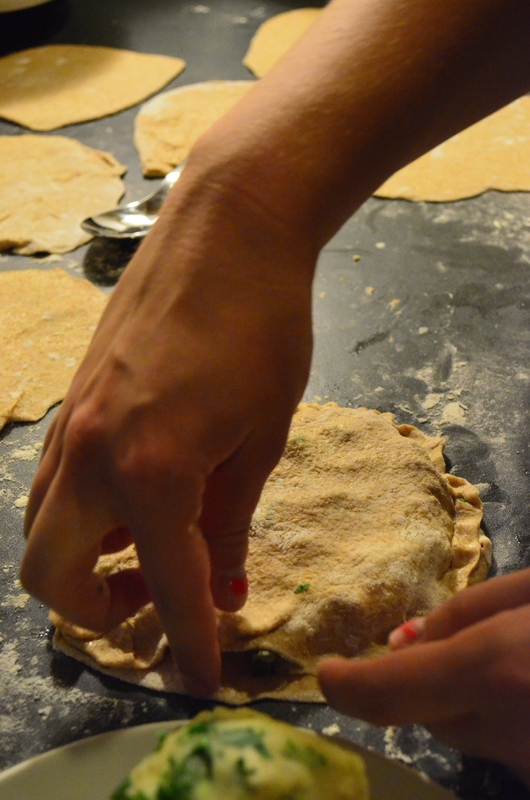 Once you have a uniform mixture, shape the dough into a ball and place it in a lightly wetted bowl. Allow this to rest, covered, for around 30 minutes. Meanwhile, boil and peel the potato for use in the filling. Once the dough has rested, knead for another minute and then divide it into 8 equal sized portions. Coat each lightly with flour to avoid sticking, and roll them into an approximately 5 inch rounds. 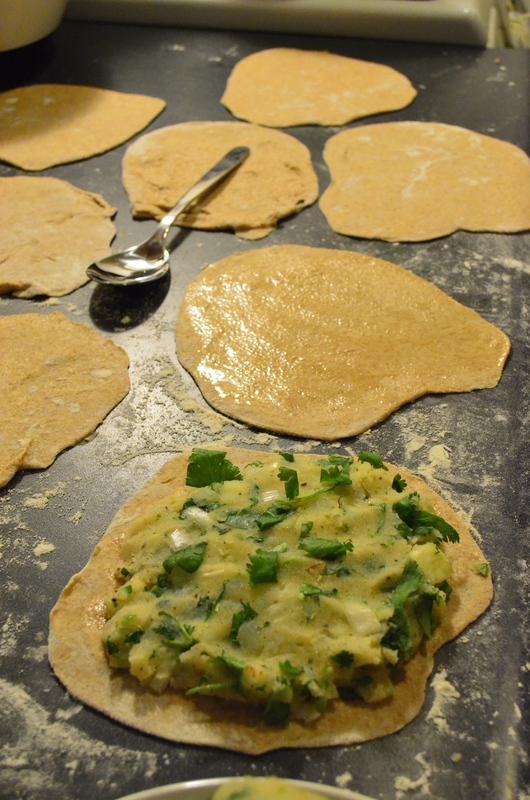 Set these aside for later use, and proceed to assemble the filling. In a large bowl, mash the peeled potato until it adopts a uniform texture. Add the remaining ingredients, and then divide the mixture into four equally sized balls. 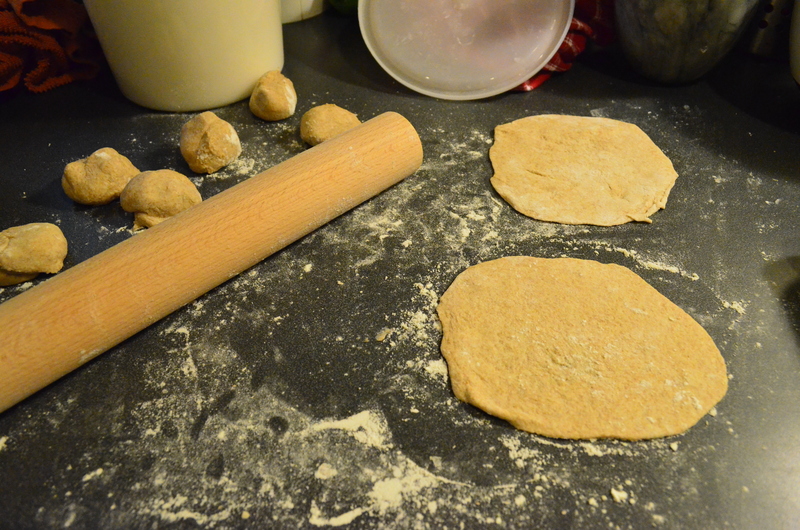 Take two of the dough rounds, and coat one side of each with vegetable oil. 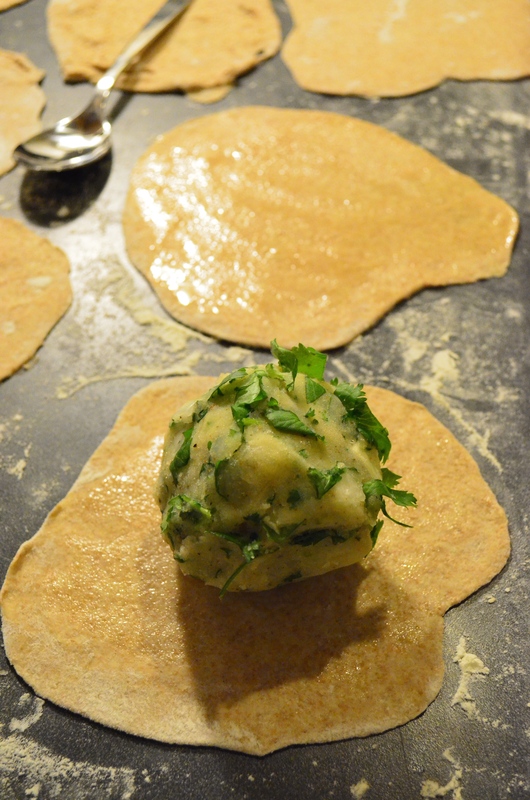 Flatten one of the filling portions onto a round, allowing it to expand almost to the edges of the dough, and then cover with the second oiled round. Crimp the dough edges together to form a seal. Don’t worry too much if the dough stretches thin or tears slightly, it will just fry the potato slightly. To cook the stuffed breads, heat a large cast iron skillet over medium-high heat. Add a prepared round to the skillet and allow it to cook for one minute before carefully flipping the cake. Cook for another minute, and brush vegetable oil lightly over the exposed (cooked) side. Flip again to cook the oiled surface for 30 seconds while oiling the second side. Finally, flip a third time and cook for 30 seconds. In total, each side should have been exposed to heat for 60 seconds pre-oil, and 30 seconds post-oil. When cooking the paratha, I found that high heat tended to char the breads a bit too much, so I have suggested medium to medium-high depending on your stove. Experiment, and let me know what works for you. Fold finished breads in aluminum foil to keep them warm while you finish cooking the rest. Tepary Bean Dip with Mexican Rice, Ground Beef, and Guac! Living in the Bay Area, Ali and I have easy access to some of the best Mexican food in America. Any trip to the Mission District of San Francisco is incomplete without a delicious detour, followed by an hour of trying not to think about the quantity of lard crammed into my carnitas burrito. Throughout the East Bay, however, there is a startling lack of top notch Mexican food. We pick up tex-mex often enough, but it is nothing special. 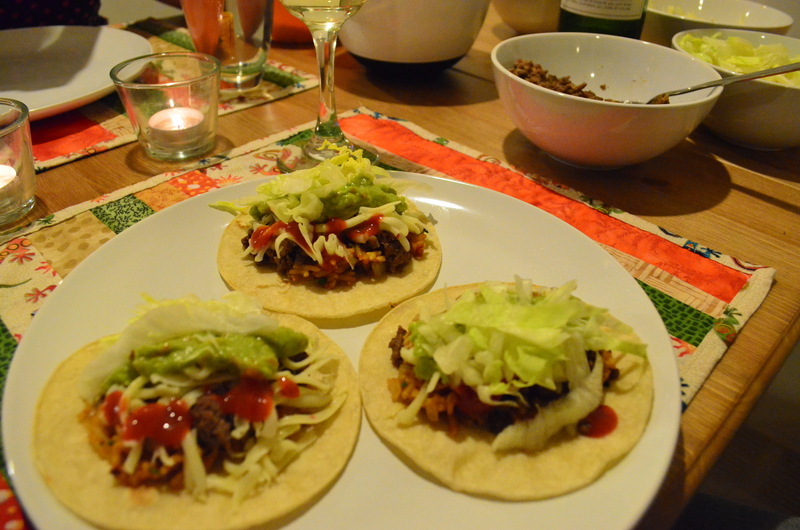 As a result, I throw together homemade tacos every couple months. It’s a crowd pleaser, gives me an excuse to make guacamole, and the exact components can change a lot depending on my mood. Mexican cooking in my kitchen varies greatly, ranging from sautéed ground beef tacos (on the table in 15 minutes) to slow-cooked stew beef or carnitas (4+ hours). I usually (reluctantly) add in a beans option for the vegetarians, and these fall into a similar time frame of “however long I feel like cooking today”. I can cook for however long I choose, make pretty much any combination of toppings, and it always tastes good when you throw it all together. Garlic, onion, and chili powder tend to do that. It is hard to deny that beans are a staple in any number of cuisines, and while I am warming up to their flavor the texture still gets to me occasionally. One way to solve that is a blender. Pureed foods tend to have acceptable, uniform textures, and still taste great. Not the most visually appealing (baby) food, but looks aren’t everything. For this meal, I adopted a recipe from the Rancho Gordo cookbook. Titled as a tepary bean dip, it works equally well as a substitute for refried beans in tacos or burritos. I finished off my tacos with ground beef, homemade guac, and salsa, while Ali’s burrito included Mexican rice from “The Homesick Texan” food blog, my go to source for all things tex-mex. Assemble as you wish, top with shredded pepper jack cheese plus iceberg lettuce, and enjoy! Color coordinating your beans with their soaking pot is very important. When it comes to cooking beans, I bow to the unequivocally superior knowledge of The Queen of Legumes. On her blog, you will find detailed instructions for the preparation of dried beans. Following her suggestion, I used Rancho Gordo tepary beans in this recipe, and was able to freeze most of them for future use. To prepare the dip, merely combine all ingredients in a small food processor and hit go. I used a serrano chili because it was what I had in my fridge, but the original recipe calls for a poblano and I think it would be an improvement. In my case, the serrano added a bit more spice than I expected, even without the seeds, and I missed the substance that comes from using a poblano . Adjust the consistency as you like by adding bean broth to the mix. Beans, beans, the magical fruit….. So what is really going on with beans? As with most seeds, legumes consist of an embryo unit surrounded by storage leaves (the cotyledon) and bound up with a carbohydrate seed coat. This seed coat is responsible for some of the more….memorable aspects of bean consumption. Made up of mostly indigestible carbohydrates, the coating leaves out upper intestine relatively untouched. The bacteria in our lower intestine feast on the carbs, producing large amounts of carbon dioxide and oxygen and making up for our failure. Luckily, soaking beans in water can extract many of these carbohydrates. Internal structure of a bean seed, including embryo, cotyledon, seed coat, and hilium. 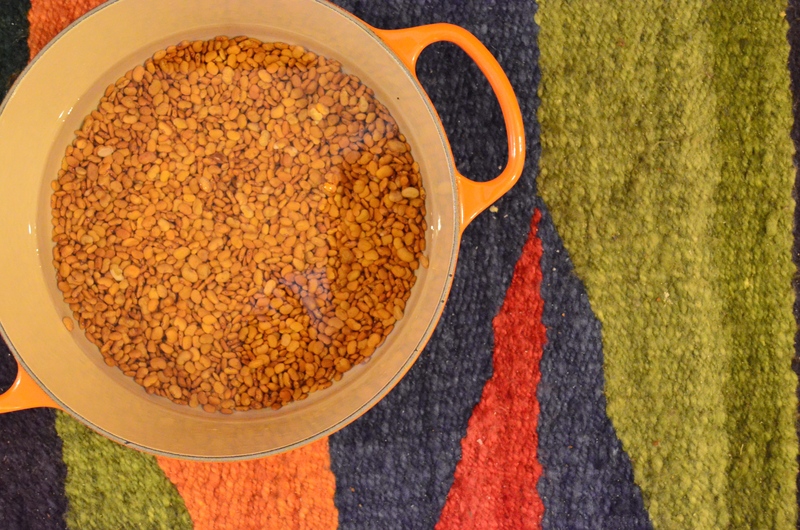 While cooking legumes, absorption of water is limited by the remarkable protection of the seed coat. In fact, initial absorption of water takes place solely at the hilium, where the bean was formerly attached to its pod. Later on, once an equilibrium is reached, the seed coat becomes fully hydrated and expands to allow widespread diffusion into the seed. We presoak beans to jumpstart this absorption process (and extract those flatulent carbohydrates) . During soaking, water gradually permeates the seed coat and saturates the cotyledon. Once heat is applied, this guarantees a rapid and even cooking process. If beans are not soaked, you are likely to end up with either a mushy, overcooked exterior or an uncooked interior, as heat diffusion occurs much more quickly than the equivalent process for water. Cooking the rice in bean broth adds flavor to this dish, and the butter gives it a richness greater than that generally found in plain white rice. 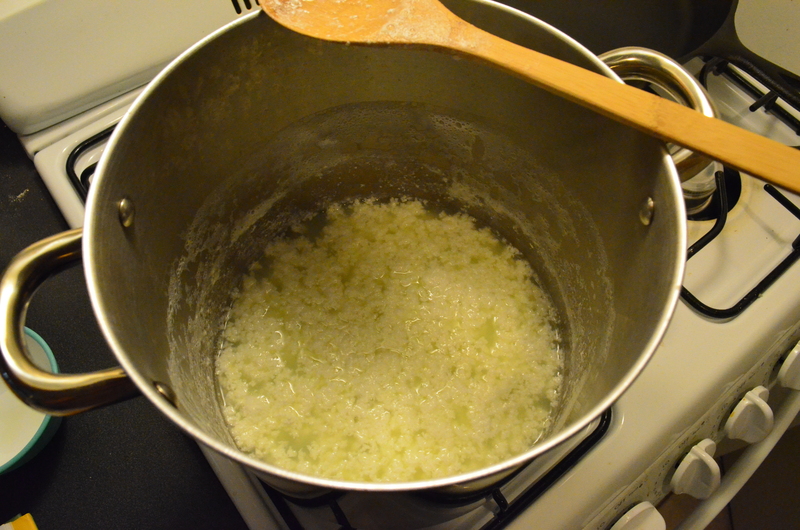 Combine the rice, broth, and butter in a small pot, bring to a boil, stir once, and then reduce the heat to low. Cook, covered, for 20 minutes. As with most recipes I cook, bean broth is used to keep the dish vegetarian. Substitute chicken broth for a stronger flavor. In a large cast iron skillet, cook the onion until slightly translucent, about 10 minutes, stirring frequently to avoid excessive browning. 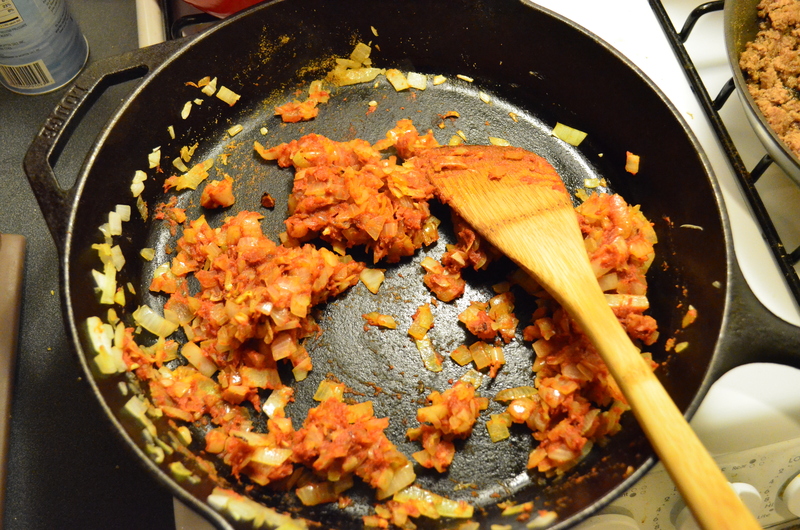 Add the garlic and cook for a minute or two longer, then toss in the tomato paste and cumin. Saute one more minute, add the rice, cilantro, lime juice, salt, and pepper and stir to combine. Serve immediately. A bit of browning on my part, but not too bad. Just waiting for the rice! Sautéing ground beef is one of the fastest, easiest ways to put homemade tacos on the table. If someone else shreds cheese and lettuce while you work, dinner can be on the table 15 minutes after starting prep. As a former graduate student, I value that speed. In this case dinner involved slightly more work, but the meat step remains the same. 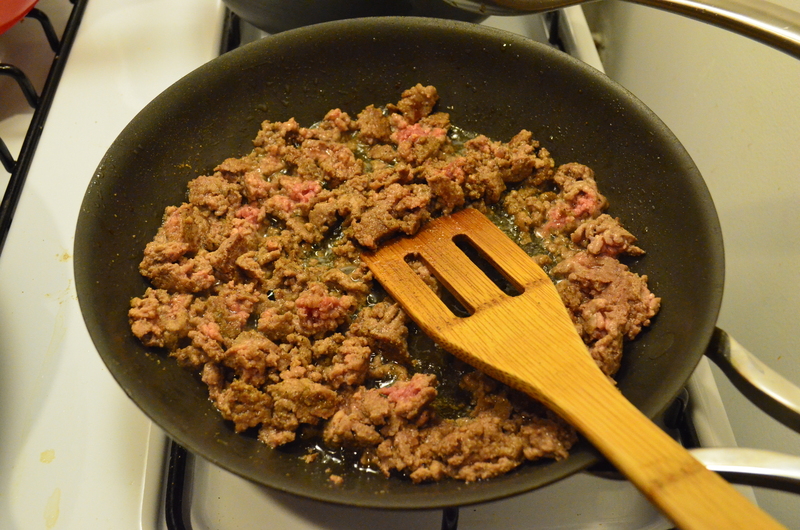 Heat a small amount of oil in a large skillet, and add the ground beef. As the meat cooks, break it up into steadily smaller pieces with your spatula, and season to taste. The beef is done when evenly browned with no remaining signs of pink. A few minutes after adding frozen beef to the pan, breaking up well. For seasoning, I use Penzeys Adobo mixture as a quick and easy spice solution, but high quality meat can stand alone with just a bit of salt and pepper. The oil is optional, especially if you don’t buy ultra lean meat, and is just to prevent sticking upon first addition to the pan. I buy ground beef in bulk when on sale. After forming some into burger patties, I freeze the remainder. When I want tacos I cut a chunk off the frozen block, and then cut that into a few smaller slices. These will heat quickly in the skillet, and break apart without any fuss. Growing up, my sisters and I all avoided guacamole. Aka weird green mush. I have since realized that my mom probably loved this, as it left more of the delicious dip for her. I only recently warmed up to guacamole, and I know Ali has mixed feelings about this development. On one hand, I now buy avocados and make guac for her on a regular basis. On the other, I now eat some of that guac, depriving her of the enjoyment. Life is hard an hour from the Central Valley. Following Ali’s advice, I keep guac fairly simple. Halve the avocados, and scoop into a medium bowl. Dice the onion and tomato finely, or pulse them quickly in a food processor (don’t go too long, you don’t want a puree). Add the mixture to the avocado, using a fork to mash the dip into whatever consistency you desire. Finally, add a dash of lime juice and salt to taste. Eat most of the dip immediately as an appetizer, regretfully leaving barely enough to top your final tacos.